Secondary conditions (symptoms) are related to both the alignment of the 1st bone of the neck (C1 also known as Atlas) as well as the alignment of the other bones of the spine. 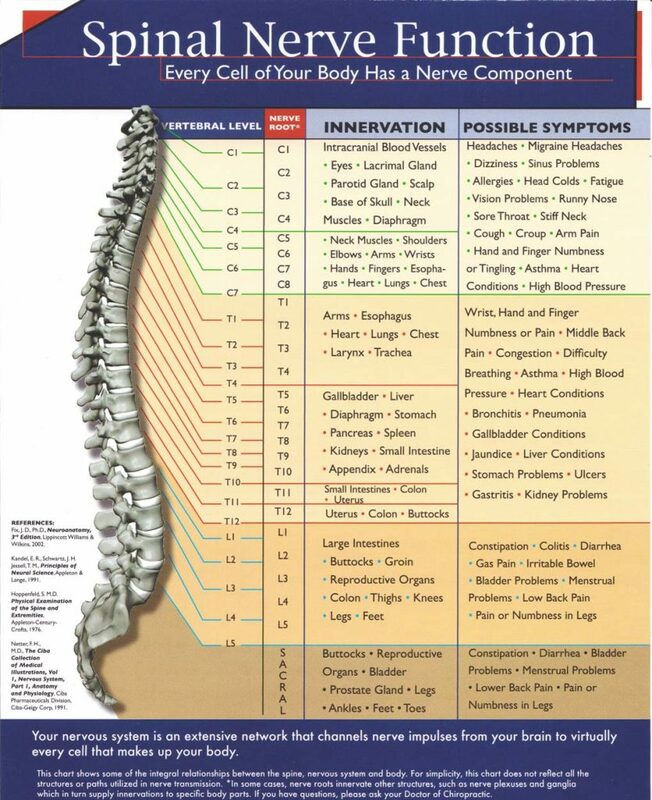 As the chart shows, each spinal level has a nerve control effect. The PRIMARY condition is the subluxation producing nerve interference. The secondary condition(s) are the effects of that interference. They include everything on the right side of the chart. For example: headaches, weak immune system, back pain, high blood pressure, acid reflux, asthma, diabetes, high cholesterol, constipation or diarrhea, infertility, irregular menstrual cycles, sciatica, and many more. These are the effects of malfunction.